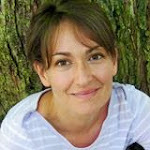 Bookshop Talk: INTERVIEW with Newbery Honor Winning Author, SHANNON HALE! 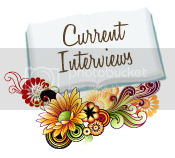 INTERVIEW with Newbery Honor Winning Author, SHANNON HALE! I was first introduced to Shannon Hale’s books by my children’s literature professor in college. She claimed THE GOOSE GIRL was one of the best young adult novels ever written, so I knew I had to find a copy. Actually, I think the most copies of THE GOOSE GIRL I’ve ever had in my possession at one time is four. You see, I have one gorgeous hardback copy to stare at in admiration, one paperback copy to take writing notes in, and generally at least one copy on hand to give away to friends or random strangers. Happily, THE GOOSE GIRL isn’t the only novel Shannon has written that I adore. But it was my first, and for that reason, it holds a special place in my heart. 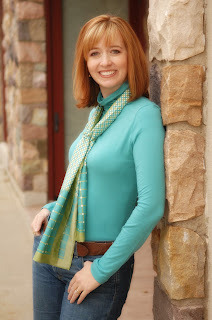 Shannon Hale is the New York Times best-selling author of six young adult novels, including the Newbery Honor book Princess Academy, two award-winning books for adults, and the upcoming Midnight in Austenland (Jan. 2012). She co-wrote the hit graphic novel Rapunzel's Revenge and its sequel with husband Dean Hale. They live with their four small children near Salt Lake City, Utah. Kim Harris Thacker: THE GOOSE GIRL , which is the first installment in The Books of Bayern series, features a young woman named Anidori-Kiladra Talianna Isilee, or Ani, as protagonist. While THE GOOSE GIRL is Ani’s story, the reader is also introduced to such wonderful characters as Enna and Razo. These two characters are the protagonists of other books in the Bayern series. Enna’s book is ENNA BURNING , and Razo’s book is RIVER SECRETS . The fourth book in the series, FOREST BORN , is about Razo’s younger sister, Rin. When you first wrote THE GOOSE GIRL, did you imagine Enna, Razo, and Rin would star in their own books? Shannon Hale: Never! I have a hard time thinking in series. I'm completely in the story I'm telling. Recently I started what I intended to be a trilogy, but now it's just turned into one long book because I guess that's just the way I think. It's always a surprise and a delight when another character pipes up, Hey, what about me?! KHT: Each of your Books of Bayern features a young woman who discovers she can “speak,” in a way, with nature. If you could have such an ability, what would yours be? SH: Wind. I'm a total geek and I sit in the wind and imagine what it's saying to me. Of course I do that with trees too and animals. I mean, I USED to do that, when I was young and innocent. I'm much too mature to do that now, I swear. Well, maybe just sometimes... I wish I had people-speaking, but only if I didn't go evil. Nevermind, I don't want people-speaking. That sounds too exhausting. Wind is nicer. KHT: AUSTENLAND is an essential read for anyone who adores Jane Austen, but especially for any woman who appreciates Colin Firth’s performance of Mr. Darcy in the 1995 BBC adaptation of PRIDE AND PREJUDICE . And now you’ve written a sequel to AUSTENLAND called MIDNIGHT IN AUSTENLAND (released January 2012). Does that mean you’ve discovered a BBC Austen hero portrayal that is even more wonderful than the Firth/Darcy? Can you tell us a bit more about what to expect from MIDNIGHT IN AUSTENLAND? SH: Yay! I love this book and this world and am having so much fun with it right now. I used a different narrator in Austenland, which allowed me to make it a comedy, which is a treat for me. Midnight in Austenland is about Charlotte, a completely new woman vacationing at Pembrook Park. Some of the characters from Austenland are still there, but there are several new ones. It's heavily influenced by Northanger Abbey . KHT: All of your books but two (RIVER SECRETS and CALAMITY JACK , the second graphic novel you have written with your husband) feature a female protagonist. How is writing a story with a male protagonist different from writing a story with a female protagonist? Did you do anything special, like literally walk a mile in your husband’s shoes in preparation to write these books where males are the main characters? SH: My husband wears a size 15. I can't take a step in his shoes without them falling off. Well, they're not so much shoes as boats. Houseboats maybe. You know, I never thought I'd write from the POV of a boy because I'm a girl and I didn't want to get it wrong. But I knew Razo and Jack so well by the time I got to their books that there wasn't any fear. My husband is always a helpful male voice too. 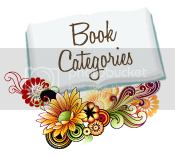 KHT: Your novels are filled with well-developed characters, from the courageous Dashti in BOOK OF A THOUSAND DAYS , to the inebriated Sir Templeton in AUSTENLAND. These characters are so real, they breathe! I imagine they have to eat, too. So my next question is, if you could invite one of your characters to supper at your house, which one would you invite, and why? Also, which would you be sure not to invite, and why? SH: Thank you! Aren't you sweet? I do love Dashti. I'd like to be Dashti. I want Becky Jack from The Actor and the Housewife as a next door neighbor. I want a friend as fierce and loyal as Enna. I totally get Miri from Princess Academy as if she were myself. But to come to dinner, hands down, it'd be Razo. I'd better prepare a lot of food. It'd be fun to feed him though. He's such an appreciative eater. Sometimes I'm a little grumpy that I don't get to actually be friends with Razo. Selia is not welcome in my home. She's just so oily I'd want to take a bath after, and what an energy sucker. KHT: In your Newbery honor-winning novel, THE PRINCESS ACADEMY , a group of girls, whose ages range from twelve to seventeen, are sent from their homes on Mount Eskel to live and study at a nearby academy that has been set up specifically to give these rural girls training in how to be princesses. At the princess academy, the girls are taught many skills by their teacher, Tutor Olana. If you were Tutor Shannon, and there were a Writer’s Academy for young people ages twelve to seventeen, what would be the single most important thing you would teach there? SH: You know, I never get used to the "Newbery honor" part. Still gives me chills. And that's an interesting question that I've never been asked before, which doesn't happen often! I actually have a secret goal to one day have a writer's academy for girls of that age. A week-long camp that includes writing workshops alongside other topics of interest to writers and helpful life and communication skills. I attended something like that (only not for writers) when I was a teen and it was so helpful. I have young kids, so it's not going to happen in the next 5 years at least. But the talent of being able to communicate--to listen and to express yourself--is so valuable and so neglected, I would do a session on that for sure. KHT: Will you please give us a short list of your all-time favorite novels? SH: I can't! There are so many I love for many different reasons, and too many writer friends I'm afraid I'd neglect. But here are three that I've reread in the past year: The Westing Game , Northanger Abbey , and The Thief . Thank you, Shannon, for taking the time to visit with us today! Awesome interview! Shannon Hale (and her books) rock! Thanks for another great interview, Mrs. Thacker! What a fun interview. I hope Shannon starts that academy one day. Writers (and writing) had a huge positive influence on me as a teen. Thanks for the great interview. And because I'm a nerd, I noticed that THe Goose Girl is in that pile of books you're holding in your picture. Yay! I have many favorites written by Shannon Hale, but I was absolutely blown away by BOOK OF A THOUSAND DAYS!! It was different from anything I had ever read before, and I felt completely transported into a world that felt 100% fresh and compelling. I remember thinking "How is it that I can be so entertained by a girl trapped in a tower with nothing but a cat, a spoiled princess, and a bunch of rats?" And yet I read the book pretty much straight through! Great interview, Kim! Thanks so much! MKHutchins: I loved BOOK OF A THOUSAND DAYS, too! And you'll certainly enjoy Shannon's other books. They're all amazing! Shelby: Thank you! And I agree--Shannon Hale and her books both rock! Shannon: Thank you for agreeing to do this interview! I had a ball re-reading your wonderful books in preparation for this. And yes, THE GOOSE GIRL is in my pile of books in that photo in the sidebar. I wouldn't be without it! Amy: I was blown away by BOOK OF A THOUSAND DAYS, too. You know it's great writing if an author can set a large portion of the story in one constrained place. I admire Jane Yolen's and Robert Harris's novel, GIRL IN A CAGE, for the same reason. Wouldn't I love to learn how to write like that?! Why yes, I would! Wonderful interview, Kim with creative questions. I had no idea there will be another Austenland book. Great news! One of my favorite escape books. Kim K., I'm really excited about MIDNIGHT IN AUSTENLAND! It sounds awesome, doesn't it? Fantastic questions Kim! I LOVED this interview. Looking forward to reading Forest Born. I love Shannon Hale and her books. So does my daughter. She's one of our favorite authors. Enjoyed the interview. Alexa: You'll love FOREST BORN! It's absolutely amazing, as are all the Bayern books. Alice: There's nothing better than enjoying books with your kids! Way to go!! !